This is Belinda Bauer’s 8th book but only the second one that I’ve read. 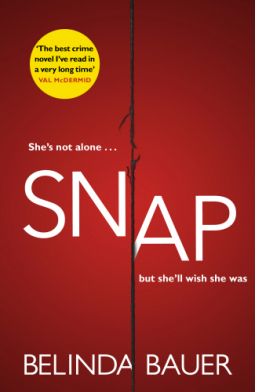 I loved her first book, Blacklands, about a serial killer, told mainly from a child’s point of view, so I was looking forwarded to reading Snap. I enjoyed it but I was a bit disappointed as I read it, as it relies quite a lot on several coincidences and some of the characters were not much more than caricatures, particularly the police, Detective Inspector John Marvel, who is a bit of a maverick and Detective Sergeant Reynolds, who in contrast, is a stickler for correct procedure. However, I think the children in this book come across as real characters. I liked the opening as eleven year old Jack and his sisters, Joy, nine years old and Merry aged three sit in their broken down car, in the sweltering sun, on the hard shoulder of the M5 motorway. Their pregnant mother didn’t have a mobile phone with her and had left them alone in the car as she walked up the road to find an emergency phone to call for help. She never returned. Move forward three years to find Jack, now fourteen and his sisters living alone – their father couldn’t cope after his wife had been found dead by the motorway – supporting his sisters through breaking into houses to steal food and valuables. He is ‘guided’ in his criminal activities by Louis – in the same way that Fagin taught boys to pickpocket, Louis tells Jack which houses will be empty so that he can break in without fear of being caught. Then Catherine While and her husband Adam are brought into the story, when Jack breaks into their house thinking it is empty. However Catherine, pregnant, had stayed at home whilst her husband went out and is horrified to discover that she is not alone in the house. But for reasons of her own she doesn’t tell Adam or inform the police, which puts her in a dangerous situation. The story is well paced and I was keen to find out what had happened to Jack’s mother, how he would cope with being responsible for his sisters, whether he would be caught and whether his father would return. And I was most concerned about Catherine’s safety! So overall I did enjoy it, despite the coincidences. It’s quirky and different from other crime fiction, which is refreshing. I keep meaning to read one of her books. Guess it will happen one day. This one does sound interesting, but I might start with another. I’m sorry to hear that this one didn’t quite do it for you, Margaret. I know what you mean about the lack of depth in some of the characters; I’ve had that experience, too, of reading about characters who didn’t quite feel real. Still, it sounds as though you liked it overall, and that’s good to hear. It’s on my wish list..
Belinda Bauer is a favorite author of mine as well. I plan to read “Snap” very soon.